There are plenty of pretenders out there too, and you know them when you see them (usually that’s when you turn the channel). Later, I’ll list my top ten tough guys. But first, I want to focus on one in particular: The baddest of them all, the iconic Clint Eastwood. Clint is the all-time tough guy. He damn near invented the genre. Sure, there were plenty of macho actors before him; John Wayne, Charlton Heston, Gary Cooper, James Cagney, and a handful of respectable others. But none of them are in the same class as Eastwood. Consider this: If Clint had quit acting after his three legendary spaghetti westerns (A Fistful of Dollars, For a Few Dollars More, and The Good, the Bad, and the Ugly), he would still have to be considered among the greatest tough guys to ever hit the screen. But he didn’t quit. He’s stared in 47 movies to date, playing tough guys in most of them, doing it the way only Clint can. Hell, at age 78, he played the role of Walt Kowalski in Gran Torino, one of the best macho roles of his career! 1. A Fistful of Dollars – You think director Sergio Leone made the right choice picking Clint to play the Man with No Name? Eastwood’s version of a lone gunslinger became the measuring stick for every Western antihero since. 2. For a Few Dollars More – How could Sergio Leone improve on A Fistful of Dollars? Add Lee Van Cleef, whose steely squint nearly matched Eastwood’s. Together they wipe out a band of Mexican outlaws. Outlaw: “Hey, amigo, you know when you told that story yesterday, I fell for it. 3. The Good, the Bad, and the Ugly – This three hour epic became an instant classic. Eli Wallach gave the performance of a lifetime alongside Eastwood and Van Cleef. The musical score, now 45 years old, is indelibly stamped in American culture (If you are unfamiliar with the soundtrack, make this movie the next one you watch – it’s considered a masterpiece by many film critics). 4. Where Eagles Dare – Eastwood teams up with Richard Burton in a mission to penetrate the Schloss Adler, a Nazi fortress where an American General is held prisoner. This film is chock full of machine gun battles, chase scenes, and includes a harrowing battle atop the cable car leading to the Bavarian castle. The musical score, ominous and powerful, sets the prefect tone for this thriller. 5. Kelly’s Heroes – Eastwood’s second WWII movie is wildly entertaining. Part comedy, part war drama, part bank heist caper, director Brian Hutton somehow made it all work. The cast is certainly among the greatest ever assembled: Eastwood, Carroll O’Connor, Telly Savalas, Don Rickles, Donald Sutherland, Harry Dean Stanton, and Gavin MacLeod of Love Boat fame. Sutherland, as a pre-era hippie, is particularly hilarious. 6. 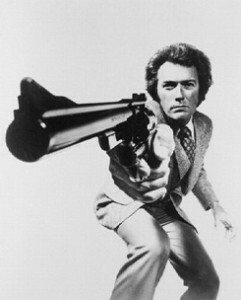 Dirty Harry – Eastwood’s Dirty Harry Callahan is his most famous character. Often imitated but never matched, Callahan set the standard for the tough guy cop persona, and he set it unfairly high. His relentless pursuit of the killer, Scorpio, his disregard for rules and convention, and his classic monologue at the end all make Dirty Harry a great and unforgettable movie. 7. High Plains Drifter – In this eerie Western, Eastwood’s nameless character (actually, a ghost of a previously murdered sheriff), rides into a corrupt town and exacts revenge on the three outlaws who killed him, as well as the townspeople who supported them. Directed by Eastwood, this film holds its own against the spaghetti Westerns. 8. Magnum Force – The much anticipated return of Harry Callahan resulted in a film as good or better than the original. Magnum Force retained all the gritty realism and tension that made Dirty Harry great, but benefitted from slicker cinematography and a superb soundtrack. Clint’s acting is dead on, his character tougher than ever and utterly convincing. Director Ted Post never let Clint become a caricature of himself (unfortunately, the same cannot be said for Eastwood’s final Dirty Harry film, The Dead Pool). 9. Thunderbolt and Lightfoot – This underrated flick stars Eastwood as a bank robber looking to duplicate a job from years past in Montana. Jeff Bridges and George Kennedy are excellent in supporting roles, as is Geoffrey Lewis, who went on to play characters in a half dozen Eastwood movies. In between the chase scenes and shootouts, the interplay between Eastwood, Bridges, Kennedy, and Lewis is what makes this film exceptional. remorseless killers. His commercial success was due in large part to his roles as The Man with no Name and Dirty Harry. It wasn’t until he was in his sixties that he examined the myth of the gunfighter and revealed the human element that his previous works had never broached. The result was Unforgiven, which won four Academy Awards, including Best Picture. Gene Hackman and Morgan Freeman were outstanding in supporting roles, and Clint narrowly missed a Best Actor award (Al Pacino won for Scent of a Woman). 11. Gran Torino (I said I’d limit my picks to Eastwood’s ten best, but I lied) – This movie caught everyone by surprise. Seriously, playing a badass tough guy at age 78? I think it’s safe to say that no one could pull it off except for Eastwood, and he pulled it off and then some. His onscreen presence is every bit as potent as when he was half the age. The story of an old, bigoted Korean War vet doing battle with a gang of street thugs may seem implausible at face value, but Clint makes the film crackle with conviction. Gran Torino became Eastwood’s most commercially successful movie. Okay, that’s the top eleven. My twelfth pick would have been The Eiger Sanction, a spy thriller based around a climb of the north face of the Eiger in Switzerland. This film has some great mountaineering scenes, but actually the book is better than the movie. Speaking of books, if you enjoy Clint Eastwood movies, you might enjoy my Dan Reno novel series. Reno is pretty tough himself, and he’s also a fan of Clint’s movies.